Paratroopers with a mix of experience on a mission to destroy a communication point just before D-Day discover secret base carrying out Nazi experiments. High concept super soldiers are nothing new, but don’t expect a low budget affair, director Julius Avery’s offering of a Billy Ray and Mark L. Smith screenplay is wonderfully delivered with high production values. From a parashoot drop that could easily belong in Saving Private Ryan to like a small French town setting echoing the likes of The Keep and The Piano, Overlords hooks the viewer in from the outset. The B-film concept is executed by Avery with blockbuster gusto, high production values, excellent locations sets and costume. The cast is on form, the lead Jovan Adepo is excellent as thoughtful Private Ed Boyce who uncovers the Nazi experiments below the church and radio tower. Taking a leaf from 1982’s The Thing with surprise deaths and sacrifices the supporting cast is out standing notable are edgy Wyatt Russell as Ford, memorable Mathilde Ollivier as Chloe, John Magaro as sniper Frank, to be honest you could list them all. With first class gross out special effects, as the gore amps up and mutations showing inhuman strength plays-out with an end baddy showdown granted it loses the realism of the WWII shooting and explosive action setups throughout. Nevertheless, it’s still an entertaining, tense at times, finely crafted film from Avery. Recommend. Orin, an escaped slave must free his people from an underground mine but first journey across the galaxy to fulfil his destiny. Directed and produced by Steven Hahn, and written by Jeffrey Scott Starchaser borrows from Flash Gordon, Star Wars, the King Arthur Legend, even a bit of Blade Runner and many more. It’s more young adult orientated, almost in the ballpark of Ralph Bakshi, there’s disturbing 2000 A.D-like half-human, half-machine Man-Droids, Fembots. with some above PG choice language and surprise deaths, it offers an emotional clout and punch. While the pace is at times is a little clunky like the Battle Star Galactica carbon robots, the animation (with no use of rotoscoping) is outstanding for the time. The music Andrew Belling is fitting. The characters, especially the robot leads are quite likeable, the evil overlord Zygon is notable. The voice acting is great and there’s even a nice little twist to close of the proceedings. Overall, refreshingly made before CGI it borrows from the best and worst of sci-fi and comes out on top. Recommend. While the ending to The Predator (2018) was outlandish enough special effects wizard Yuri Everson provided some behind the scenes images that hinted at a crossover time-travel ending to The Predator – with Aliens’ Ripley and Newt! Stunt actress Breanna Watkins portrays both characters for the filmed but unused wacky endings. 40 years since Laurie Strode survived an attack from killer Michael Myers, he manages to escape while being transferred. When the masked man returns to Haddonfield Laurie must protect her daughter and granddaughter and execute a plan decades in the making. Oozing with atmosphere and suspense director David Gordon Green brings Halloween (2018) back to its roots giving us a well-deserved horror follow up to the 1978 original. There’s plenty of graphic creative kills, not limited to the multiple impalements, stabbings, neck snapping and foot stomping head breaking. While all this plays out Green even manages to tidy up the mythology. The humour (thankfully limited) is done just right, notable the scene with Julian (natural Jibrail Nantambu) being babysat by (the excellent Virginia Gardner) Vicky and stoned boyfriend Dave (memorable Miles Robbins). If your new to Halloween and enjoy a good slasher film this will no doubt entertain. I personally enjoyed the many of sequels, especially Donald Pleasence’s performance in the 2nd, 4th, 5th. Writers Green, Danny McBride and Jeff Fradley’s Halloween largely wipes the slate clean and echoes some of the story beats and setups in previous outings, the gas station, the escape, a ghost bed sheet etc. Thankfully at face value it disregards but doesn’t totally rule out the elaborate supernatural mythology. While the pacing and editing is a little bumpy at times it’s respectful to the original while standing on its own two feet and shot off fingers. 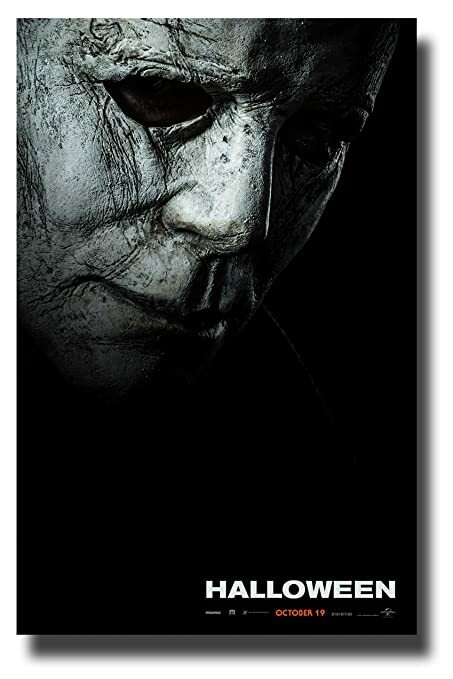 There are jump scares in places, but it isn’t necessarily scary, it’s more frightening due to Michael’s strength, non-discriminatorily violence that he inflicts and its damaging results. It’s a R/18-rated faithful sequel with an icing on the cake score by Carpenter (almost a stamp of approval of this follow up). Pleasence’s Loomis is sorely missed but actor Haluk Bilginer’s Dr. Sartain Loomis protege fills the gap with a twist. Will Patton as Officer Hawkins is notable and offers weight to the film in his meaty small role. Jamie Lee Curtis gives a haunted powerhouse performance. Nick Castle, James Jude Courtney, and Tony Moran as Michael Myers / The Shape make Myers terrifying. Judy Greer as Laurie’s daughter Karen Nelson is rounded. Andi Matichak’s granddaughter Allyson Nelson is solid but her character build-up slightly fades. It’s not on the nose explored, but there’s a lot simmering underneath the traumatized Laurie, troubled Karen and damaged Michael throughout. An eccentric uncle reveals himself to be a warlock and with the witch next door, Florence Zimmerman and Lewis must find the clock in the walls of their mysterious old house before its ominous countdown ends. The House with a Clock in Its Walls is a family-friendly supernatural adventure based on the 1979 children’s book of the same name written by John Bellairs. From horror realistic gore master Eli Roth, the director moves away from his usual adult fare for a impressive 1955 period set piece and well created magical adventure based mostly in Jonathan Barnavelts’ large house that formally belonged to Isaac Izard (Kyle MacLahlan). Jack Black sporting a Orson Welles-look is his usual likeable kooky type role self as Barnavelt, young Lewis played by Owen Vaccaro is impressive. Cate Blanchett’s fleeting Florence Zimmerman is good fun along with killer pumpkins, a room full of spooky clockwork dolls, a dog-like chair and lion hedge to name a few. MacLahlan’s troubled war vet Izard is fanstatic even if sorely underused. The his eerie makeup gives chills. Knock Knock’s Lorenza Izzo (Roth’s real life wife) is underliningly menacing as the Mother. It’s thematically heavy, with death, loss and youth fitting in at its core, it’s not a simple cash-in. The sets an special effects are well executed with an enjoyable score to match. The House with a Clock in Its Walls echoes C. S. Lewis Narnia, with a Goosebumps feel and a Disney Haunted Mansion vibe. Creepy at times with impressive sets, its one of the most enjoyable well made family films in a longtime. A bus filled with colourful mentally stressed military try to stop an intergalactic sports hunter to save sniper’s son who is in possession of alien tech that his dad unintentionally sent him after his P.O. box was closed. Following the events of Predator (1987) and Predator 2 (1990) notably including Peter Keyes’ son (as confirmed in the prequel tie-in novel and set presumably after 2010’s Predators, although not directly referenced), director Shane Black along with co-writer Fred Dekker echo the modest fun of past Predator movies. They offer a mix of gore and humour, while adding new elements and leave narrative breadcrumbs setting up future sequels. Alan Silvestri’s Predator theme music is expertly reworked but is arguably heavily used by Henry Jackman. The on location night-time shoot adds atmosphere along with the dawn space ship crashing last act. The weaponry that the Predator wields is as fanboy neat as the original character design and effects on display. Even if the Predator dogs are not a menacing as in Predators. Plot wise the writers give the classic Predator, here more agility, personality and motivation for helping the humans (as he is part human) without spelling it out in your face. They subtly explain why the “Tracker” Predator can see in heat POV without his mask due to his inbuilt biotech/biometric enhancements. Boyd Holbrook (Narcos) is on usual form and is excellent as army sniper Quinn McKenna who encounters the Predator during a mission in Mexico. Know-how, gun-toting biologist Olivia Munn is impressive alongside the soldiers including actors Keegan-Michael Key, Trevante Rhodes, Thomas Jane and Alfie Allen. Also in the castings favour is child actor Jacob Tremblay who doesn’t come across as annoying as Rory, Quinn’s autistic son. At times you care about the characters and morn when they meet their demise, Rhodes’ Williams in particular. Actor Sterling K. Brown is notable as the unscrupulous Govenment Agent. The Predator is non-stop entertainment, mixing expected lowbrow dialogue and macho talk with no holds barred action sequences and special effects. Yes it’s exciting but the action does grow more outlandish in closing followed by off the wall human Predator robotic weaponisation. This entry ups the ante, Uber style with larger action sequences bigger thrills but doesn’t reinvent or progress franchise (especially the Yautja species history or social structure as well as in previous films) as much as touted or deserved. Davey Armstrong suspects his local police officer is a serial killer, along with a group of his friends they spend their summer gathering evidence but with dangerous consequences. With the popularity of the 1980’s at an all-time high, TV series Stranger Things, the IT film remake to name a few, imagine if the Goonies and Stand by Me teens went on the hunt for a serial killer instead of looking for a dead body or treasure! Directors Anouk Whissell, François Simard and Yoann-Karl Whissell’s Summer of 84 offers a modest dark adventure which delivers just that. The cast are impressive, the teens have family struggles which ring true. Lead Graham Verchere is impressive as conspiracy fan Davey Armstrong. Judah Lewis, reminiscent of a young Rob Lowe and Michael J. Fox is notable along with likable Tiera Skovbye as Nikki Kaszuba providing the typical yet timeless (before Xbox ans PS4) crush interest. There’s a great score with John Carpenter vibes, contrary to what the critics say there isn’t an over reliance on nostalgia of the titular decade, the soundtrack is 1980s minimal, the pop culture dialogue references are only littered throughout, with the E.T, Poltergeist-like neighborhood location sprinkled with just enough 80s for you to buy the period setting as they spy on their neighbor Rear View Window and Burbs style. It not just in your face nostalgia but also has that teenage discovery, angst and your first love element which crosses generations. Technically the pacing of the three directors falters in the dark themed closing as the last act, jarringly it goes off the predicable beaten track, but thankfully everything isn’t wrapped up satisfying like an episode of Scooby Doo, hats off to the writers Matt Leslie and Stephen J. Smith avoiding a paint by numbers ending we all wanted. A troubled Vietnam veteran turned writer moves into a haunted house after inheriting it from his kooky aunt. Director Steve Miner (Halloween H20: 20 Years Later, Friday the 13th Part 2) House oozes all the wacky horror comedy staples of the 80s. In the hey days of optical effects and practical make-up House is just as fun (but not as creepy) as on its initial release. At times echoing The Evil Dead (1981), in the vein of Fright Night (1985) and clearly infulcing The Burbs (1989) in terms of suspicion and locations, it deserves a tab in horror history. Dispite some pacing issues Miner offers suspense at times with a few jump scares and eerie dream sequences. There’s severed hands and heads, an obese witch, the impressive zombified corpse of Big Ben, three demonic kids and a stop motion flying skull-face, there’s plenty of creepy visuals on display. William Katt’s Roger Cobb balances the special effects with paranoia, obsession with his missing son and PTSD, there’s a lot going it what could have been a simple two dimensional character. Notable for horror aficionados Kane Hodder (of Jason, Friday the 13th fame) serves as stunt coordinator. While the effects may not been as hidden by VHS grain and TV AV connectors on the Bluray format Miner’s House still has plenty of tongue-in-cheek horror fun. An American becomes a member of the Japanese yakuza and tries to help the clan who are under a power pressure from a rivaling gang. Andrew Baldwin in the vain of a string of 80s and 90s Japanese organized crime syndicate films, including the likes of American Yakuza (1993) and Black Rain (1989). That said, what makes The Outsider standout and more interesting from many other yakuza yarns is the 1954 post WWII backdrop and the strong cast performances. The tone and score compliments Zandvliet’s well staged ultra violent moments – fingers are cut off, throats are cut and people are shot, strangled and stabbed. With deaths echoing the Godfather trilogy writer Baldwin wisely includes the staple themes loyalty, betrayal and forbidden love with Zandvliet bringing these visually to life with the grease and atmosphere of the 50s, injected into the costumes sets and locations. 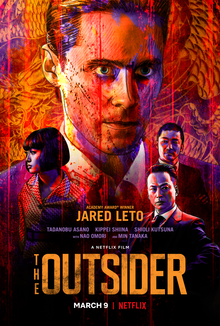 Jared Leto’s snake like performance as prisoner of war Nick Lowell is a highlight as he becomes part of the yakuza. The Shiromatsu patriarch, Akihiro, played wonderfully by Min Tanaka is notable. Tadanobu Asano is memorable as Yakuza member Kiyoshi who Nick helps out of an Osaka prison. Overall, not a gangster game changer but enjoyable nonetheless. The evil powerful Thanos is on a mission to collect all six Infinity Stones, which will destroy 50 percent of the whole galaxys population, only a group of superheroes stand in his way. With its ensemble cast (too many to mention) Avengers: Infinity War is almost wall to wall nonstop action with comic book quips throughout. Thanos is surprisingly likeable in parts and adds some emotional weight making the story more dynamic. Viewers to make sense of chaos on the backdrop of outstanding effects, fantastic sets and outlandish costumes may want to watch Civil War, Guardians of the Galaxy and Thor Ragnarok to name a few essentials to make sense of the sacrifice and devastation on display. 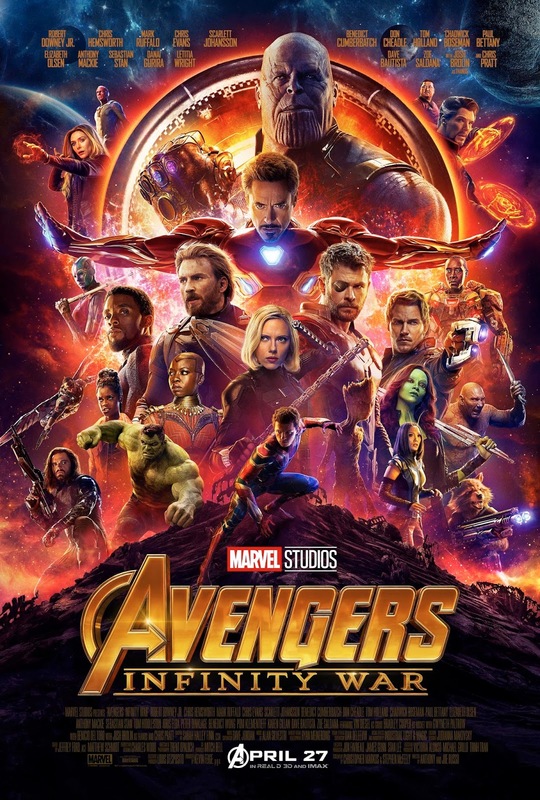 Directors Anthony and Joe Russo offer an enjoyable film with surprise deaths of beloved characters (Loki in the first few minutes) scattered over its well paced lengthy running time, which whizzes by. While older comic book readers may not be able to work out why these on screen character don’t have that secret je ne sais quoi of their paper counterparts, ultra geeks and readers of more recent comic series will no doubt find it a movie Marvel blast. Unlikely characters are paired together, creating some enjoyable comedy, tension and action moments as the story gets bleaker and bleaker for our heroes. With some sharp editing and writers Christopher Markus and Stephen McFeely leave Infinity War on a cliffhanger not seen since The Empire Strikes Back*. Or for those who will never watch another Marvel instalment, behold the most nihilistic ending to a comic book film ever. *There’s the obligatory after credit scene where Nick Fury calls on Captain Marvel to help Marvel film fans sleep at night until the next installment.